The bike was originally purchased in 1978 – probably from I.Martin cycles in LA. 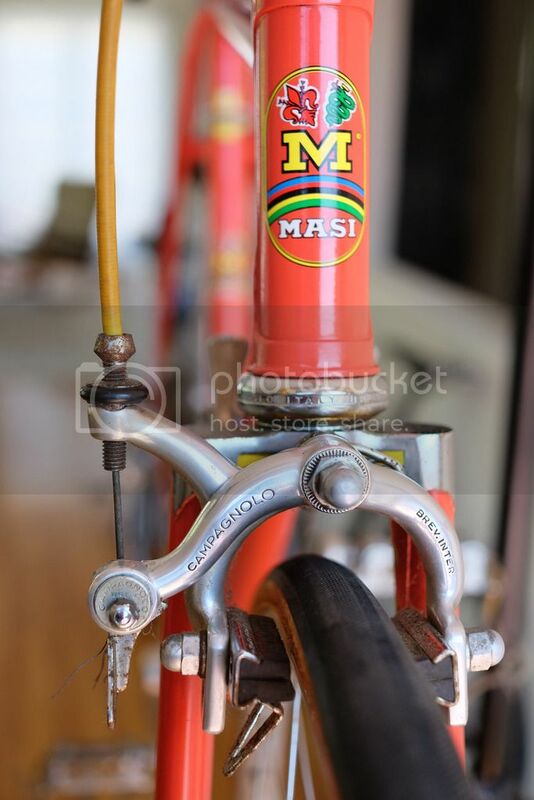 It is Masi racing red with the California style modified decals – just the ‘Masi’ on the downtube, ‘Milano’ removed from the headtube/seat tube decals and world champ version stripes around the seat tube. The fork has a semi-slotted (front and rear faces) Fischer casting crown not a Cinelli semi sloping one. Is this a 1978 ish bike do you think or something earlier? Size and photos (full profile, fork crown, rear dropouts, absence or presence of brazed on bottle bosses & rear brake cable guides) would be helpful. Interpolating from Bob Hovey's registry, it looks like yours is a 53 cm (MC53), constructed in 1977, number 01 of that period (7701). The convention is a letter in the first position for the quarter (A=Jan.-Mar., B=Apr.-Jun., etc. ), but this one has the numeral 5 (5th quarter?). If that first digit is the month of manufacture, it's curious that there's no leading zero. Last edited by oldbobcat; 11-10-15 at 11:00 PM. I do not know anything about the US serial numbers but the bike looks '76-'78 ish to me. Wonder how long the front brake pads have been installed backwards? might even turn into a long term relationship! Beautiful Masi, I like these late 70's/very early 80's Italian bikes as they were still quite conservative with their graphics and paint which makes them look very elegant compared to the later Italian bikes that became "peacock" bikes, festooned with all sorts of gimmicky graphics, crimped tubing, paint jobs and pantographing. @dadoflam, as @oldbobcat said, go to Bob Hovey's website. Then compare the contour of the HT lugs in the pics to your bike. Pay special attention to the "spoon" area under the lugs instead of the more obvious pointed tangs on top. As it was told to me (I wasn't there, of course and all my info is second-hand or gleaned from various websites), they introduced investment-cast lugs in late '75. This was a design of Mario Confente which gave more consistent contact with the tubes. The difference in shape is subtle but it can be an aid to distinguishing the earlier frames from the later ones. Dave who? Oh, now I remember. The brazed on bottle bosses and rear brake cable guides establish the newness of the bike. Masi California was a little late to this party. On the other hand, the long Campagnolo rear dropouts and slotted Fischer fork crown establish its oldness--definitely pre-1980. The lovely curve of the fork blades assert that it was not built by Lippy or Eisentraut. Hovey wrote that the highest number he came across under the Carlsbad numbering scheme is 0906. He's kind of vague about what happened between 1976 and '78, but it appears that the Rancho Santa Fe period comes before and overlaps the San Marcos period. 57701 looks like a variant on the Rancho Santa Fe numbering scheme, like they may have had the blind staggers in the months before Jim Allen came up with the "standard" Santa Fe scheme in 1978. I've got one too, a 1980. It has short dropouts, the semi-sloping fork crown, and the "Gran Criterium" and flag decals on the down tube. I love these bikes, the subdued paint schemes, the lack of excessive pantographing and chrome, and their classic profiles. They ride pretty nice, too. You are saying this is one of the movie bikes? That would be ultimate cool! It is indeed one of the movie bikes - it appears less in the film than the other one but importantly for me is the bike ridden by Dave in the Cinzano truck chase scene. Last edited by dadoflam; 11-12-15 at 05:15 AM. Somewhere online, perhaps DiabloScott's website (Diablo Scott's Bike Blog: Breaking Away) or maybe one of the articles in Bob Hovey's Masi pages, there is a description of the bikes they built for the movie. If this is indeed one then you have some answers available. My memory says the bikes were built in 1978 specifically for the movie. 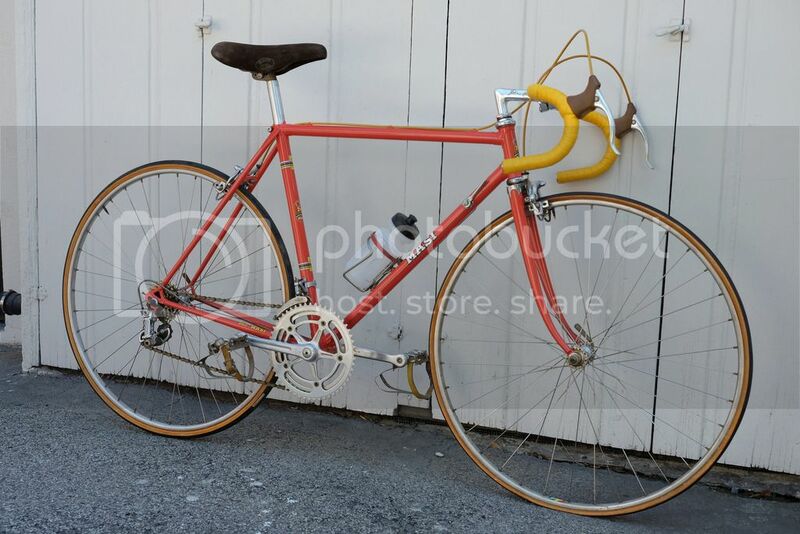 The 'other' bike used is reported as a 1978 GC serial no MC54 B7814 with a Cinelli fork crown not a Fischer one. It was significantly damaged in recent times and repaired by Gangl cycles with different components and decals. The two Masi bikes had some differences which perhaps explains particular recollections quoted on various sites from those involved with Masi and the film at that time which are not always reflected by what you see in the movie. - ie the assertion that both Masi bikes had blue chainstay decals for example - so I am being a little cautious about taking everything quoted on face value. My information is that both bikes were likely purchased at the same store at the same time (early '78) which I think corresponds with several changes at Masi including workshop location and staff. I am guessing that the bike above may have been unsold 'old stock' item from Carlsbad workhop whilst the other was fresh from the factory in 78. Last edited by dadoflam; 11-12-15 at 12:37 PM. Well, I'll be . . .
Come on now, he wasn't doing 60mph when he installed the brake pads. Unless he installed them in the back of a moving truck, but probably not that truck.